Matador is a variant on regular draw dominos and is similar in some ways to Muggins dominos. The main difference is that when you’re playing Matador you must try to get the ends of the dominos to add up to seven. In Matador, you don’t even need to play matching dominos, so long as the number adds up to seven then you’re able to play. Any dominos that have spots on the one tile that adds to seven (3-4, 6-1 etc) are called ‘matadors’ and can be considered a wild card. Also, the double zero is considered wild and can be played at any point throughout the game. 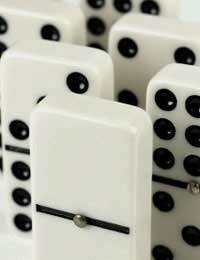 They can be added anywhere to the domino layout and only a matador can be played onto a double zero domino as it can’t add up to seven when added to any other tile. All dominos are placed in the centre of the table and shuffled facing downwards. Each player then draws dominos for their hand and the number they choose depends on how many players there are. In general, Matador is best played with two to four players. If there are two players, they must choose seven dominos each. Three players draw six dominos each and four players must choose only five dominos each, with the rest being left in the centre. As in common in many domino games, the player with the highest double must play first. The play continues on to the left and each player tries to play a domino that will add up to seven with an existing piece. If someone has a double in their hand they are able to play it lengthwise on the existing layout. If they have a matador however, this can be played either lengthwise or crosswise. If someone plays their matador crosswise then either end of it can be considered to be in play and used to add up to seven for the next player who is playing their domino. As game play continues in Matador, each player must continue playing their dominos if they’re able to add up to seven. If they can’t play a domino to do this, they must choose another from the centre pile. If they still can’t play, then they must pass their turn. This is also the same if there are no more tiles left in the centre. The game will end when a player has played all the dominos that they have in hand or when nobody is able to play any more. At this point, the player who has the least number of dots left on their dominos win the accumulative points of all the other players dots. The score is then noted and the game continues to an agreed number, usually 100 or 200. In matador, if you're playing with a larger number of people, you can play with larger numbers of dominos. Six or less players will get six dominos each and seven to eight players will get five dominos each. The strategy here is to try and hold two strong suits that add up to seven. This could be 3's and 4's for example. The blank dominos are therefore important as they can be used to force an opponent's matadors or to end one side of the train. Effectively the 0-0 domino is the most important piece in the game in this case. Try and hold onto your matadors until the point where you wish to block an opponent by altering the end of the train to something he or she doesn't have. Even though Matador itself is a variant on draw dominos, there are also variations within Matador that can be used to keep the game interesting. Some people choose to play with a double twelve set of dominos rather than a double six. In this instance, all the connected dominos must add up to 13. This also allows for more players than the usual maximum of four. Other smaller variations include using the first double as a spinner where you can play off all sides or allowing players to draw from the centre pile until they find a domino to play. In regular Matador drawing from the centre pile is limited to one turn and then a pass. All these variations can keep the game interesting if it’s something you play often.